……it’s just an illusion…or is it? There will be a New Moon at 15°07’ of Sagittarius on December 7th. This is a pretty buoyant New Moon, by all means be optimistic but don’t get too taken away because it could be an illusion! 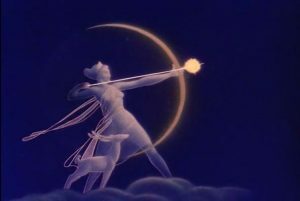 On New Moons we set our intentions for the month ahead and this one in particular offers the Sagittarian perspective on our destiny and our relationship with the universe inviting us to look ahead with optimism. This New Moon comes sandwiched in between Mercury stationing direct (the previous day) and Mars conjoining Neptune in Pisces (the day after). The lunation has just passed the degree of an exact square to Mars and Neptune conjunct in Pisces. This could mean that optimism and grandeur (Sagittarius) could be difficult to grasp (Pisces) or that our vital energy (Sun) could dissipate in day dreams and idleness (Neptune conjunct Mars). Again, our emotions (Moon) need the truth (Sagittarius) but the energy (Mars) is hard to grasp and channel into our dreams (Neptune) or, we could be guided by a higher power (Neptune) in all our endeavours (Mars) but we may be at odds with our conscious desires (Sun) and our instinctive urges (Moon) which tend towards more self-righteous (Sagittarius) actions. We now have 3 planets in their own signs: Saturn in Capricorn, Jupiter in Sagittarius and Neptune in Pisces so they are all strong in the best way they know how to be. With Jupiter in Sagittarius making a square (by sign) to Neptune in Pisces our optimism and therefore our imagined authenticity could be completely off track or out of focus and this may mean that our compassion too could be misdirected so do be careful about committing completely to a cause that in hindsight could appear a little exaggerated. In the meanwhile, Saturn observes the chaos from stern Capricorn seeking a firm foundation to build upon. In his book “Moon Phase Astrology” author Raven Kaldera calls this Moon “the Gypsy Moon”. On this Moon he invites us to go out and experience new cultures and ideas, with the aim of stretching our abilities to accept all things foreign in order to challenge ourselves and our own prejudices. What better way to do this than travelling which can provide excellent points of view upon which to reflect when the journey is over. So, rather than just reading about new places it would be better to experience these in person on your own skin so as to say. Particularly interested in this New Moon will be those persons with planets or angles between 13-17° of the mutable signs (Sagittarius, Pisces, Gemini and Virgo) and on the antiscion point of 14°53’ Capricorn. The Sabian symbol for 16° Sagittarius: “Sea gulls fly around a ship in expectation of food.” Indicating the easily acquired dependence of psychic desires upon the stimulation of social circumstances. For its antiscion point 15° Capricorn: “In a hospital, the children’s ward is filled with toys.” Indicating the responsibility of society to ensure the welfare and total health of the new generation.